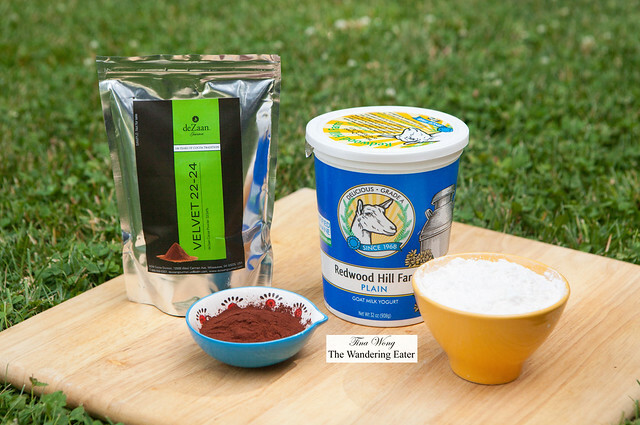 I’ve recently tried experimenting with two great brands — deZaan Gourmet for their fantastic chocolate and cocoa powders and Redwood Hill Farm goat’s milk dairy products. deZaan brings a century of tradition, quality and technical leadership to an impressive portfolio of premium cocoa and chocolate products, including cocoa powders, cocoa butter, cocoa liquor and custom chocolate formulations. Their cocoa powders are available in a variety of flavors and color shades — from vibrant reds to dark browns and black — with various accompanying taste profiles and intensities. Redwood Hill Farm is an award-winning, goat dairy farm and creamery located in Sonoma County, California. Committed to making the best tasting and least processed artisan goat cheese, yogurt and kefir, in this family-owned and operated company uses solar power to sustainably produce all its goat products. Both brands’ products do make for fantastic cakes. I didn’t want to bake fussy cakes since my schedule has been packed with work, dinners, and well, life. Despite of its simplicity, I still want lots of flavor in these cakes and I ensure you, there is a lot of flavor. The crumb texture is fine, moist but has nice structure that if you feel like splitting them into layers, it will hold up well. 2. In a medium sized bowl, sift the first three cake ingredients or mix with a whisk until it’s blended. In a small bowl, add the next three ingredients (sugar, lemon zest and lavender) and rub them with your fingers so the flavors of the lemon and lavender are released and absorbed by the sugar. 3. In a large mixing bowl, add the last four cake ingredients and whisk until blended. Add the infused sugar to the mixture and mix until blended. Add the remaining dry ingredients and gently whisk until it just mix. Pour the cake batter into the prepared cake pan. 4. Place the filled cake pan on top of a clean baking sheet and place it inside the preheated oven. Bake for 40-50 minutes or until the cake takes a golden brown color and when the toothpick is inserted, it comes out clean. A few crumbs on the toothpick is fine as long the toothpick isn’t covered in batter. 5. Remove cake from the oven and set it aside to cool in the pan for 3 minutes. Take a thin blade knife and run it along the edges to loosen the cake from the pan. Invert the cake onto a cooling rack set with a cookie sheet underneath and let the cake cool completely. 1. Add all of the ingredients of the glaze into a small measuring cup with a spout and mix with a whisk until the glaze is smooth (save for the dried lavender). 2. Slowly pour the glaze on the cake and let the glaze drip down the sides of the cake. Let the glaze set for 3 minutes and enjoy. 1. Preheat the oven to 350°F. Grease with butter or cooking spray a 8.5-inch x 4.5-inch loaf pan. 2. In a medium sized bowl, sift or whisk the dry ingredients — flour, cocoa powder, baking powder and baking soda. Set aside. 3. In a bowl of a stand mixer, add the butter and sugar and turn on the mixer to a medium-high speed until the butter takes on a fluffy, creamy consistency and has a pale yellow color. Scrape down the bowl. Turn on the mixer to a medium-low speed and add the eggs one at a time. Turn down the mixer to a low speed and slowly pour the kefir into the mixture. Turn off the mixer. Add the dry mixture to the batter and turn on the mixer to a low speed and turn off the mixer once the flour is incorporated. 4. Pour the batter into the prepared cake pan and bake it for 40-50 minutes. It is fully baked when the toothpick is inserted, it comes out clean. Remove cake from the oven and set it aside to cool in the pan for 3 minutes. Take a thin blade knife and run it along the edges to loosen the cake from the pan. Invert the cake onto a cooling rack set with a cookie sheet underneath and let the cake cool completely. 5. Place the fruit jam with the water in a bowl and microwave it for 30 seconds. Set aside. In a heatproof bowl, add the chocolate and yogurt and set it on top of a saucepan filled with about an inch of simmering water. Melt and stir the chocolate until it becomes a smooth, creamy texture. Once the texture is reached, remove the bowl from the pan and set it aside to cool. 6. Take the cooled cake and level the top of the cake with a serrated bread knife if there is a bump. Split the cake into three layers. Divide and spoon the jam onto the layers and spread the jam. Gently stack the cake layers with the jam facing within each other. (In other words, the layer of jam should not be facing out.) 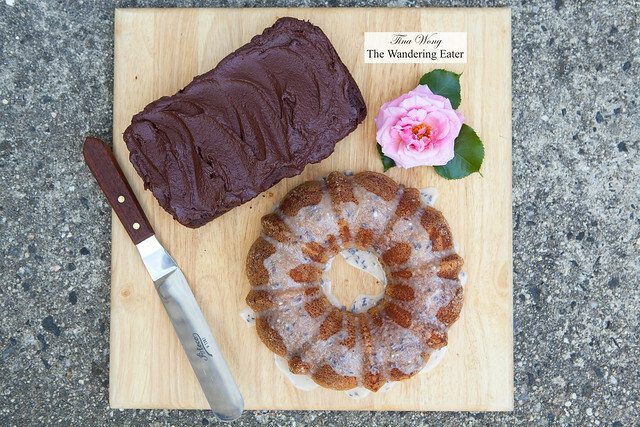 Take the cooled bowl of frosting and spread the frosting all over the cake with an offset spatula. Carefully lift your cake with a clean offset spatula and transfer the frosted cake onto a serving platter. Slice the cake and enjoy. Heading to the U.S. Virgin Islands Very Soon!